Visually analyze your web traffic data. Track your critical web traffic metrics. Share your reports with colleagues and clients. Analyze and track key web traffic metrics. Be empowered. Your Google Analytics data gets seamlessly synced to Zoho Analytics. Get your Google Analytics data analysed by a powerful BI tool seamlessly. 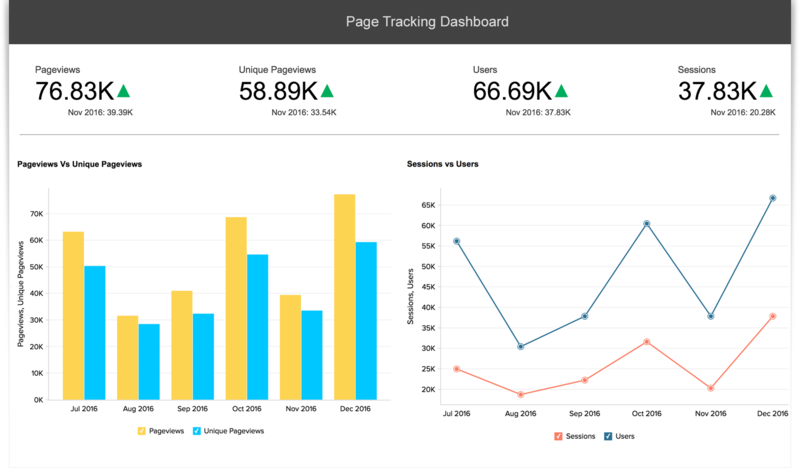 Zoho Analytics for Google Analytics provides you with 50+ ready made reports & dashboards, that you'll love and find great value instantly. Visually analyze and build insightful reports and dashboards with easy drag-and-drop interface. No technical guidance required! Use a wide variety of charts, pivot tables, kpi widgets & tabular view components to build insightful reports and dashboards. Develop reports together with your colleagues and collaboratively analyze them for informed decision making. Reports & dashboards can be scheduled for emailing or can be exported into a variety of file formats for offline access. Embed your reports and dashboards across websites, blogs, applications or intranets for wider consumption. Governed by strong Zoho Security Practices, including support for a secure encrypted connection. "With Zoho Analytics, we can access our data from anywhere, and sharing of reports has become a lot more easier."